Praised by the likes of MaximumRockNRoll and The Onion AV Club, the As You Were series features contributions from comic book and web-comic artists active in punk rock communities from around the world. 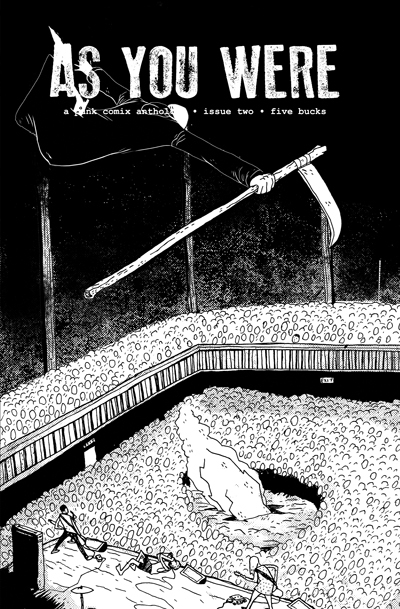 Curated by Mitch Clem (Nothing Nice To Say / My Stupid Life), the second issue’s theme is “The Pit”, with 80 pages of brand new content from 25 artists including Mitch Clem, Ben Snakepit, Liz Prince, Ramsey “Everydaypants” Beyer, Rachel Dukes, Sarah Graley, Steve Larder, Will Laren, Ben Sears, and many more. As You Were #2 is available by mail-order from the Silver Sprocket web-store, and retail distribution through Revolver and Last Gasp, with a suggested retail price of $5. Adrian Chi, Andra Passen, Andy Warner, Ben Snakepit, Brad Dwyer, Brian Connolly, Corey Parkhill, Jim Ketter, Jed Collins, Jason Oberbichler, Liz Prince, Marcos Siref, Meg, Mel, Mike Funk, Mitch Clem & Nation Of Amanda, Rachel Duke, Ramsey “Everydaypants” Beyer, Rick V, Rob Cureton, Sarah Graley, Steve Larder, Will Laren and Ben Sears.